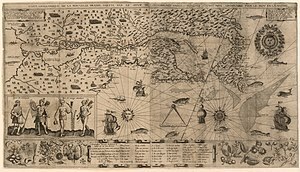 Map of New France (Champlain, 1612). Jean de Brébeuf and Gabriel Lallemant stand ready for boiling water/fire "Baptism" and flaying by the Iroquois in 1649. Also, from 1687 to 1704 the Jesuits established twenty-three missions in the Sonoran Desert, in the Provincias Internas of New Spain, present day northwestern Mexico and southern Arizona. The Suppression of the Society of Jesus by 1767 in the Spanish Empire led to their expulsion from the Viceroyalty of New Spain. The Franciscans replaced them in supporting existing and establishing new missions from 1768 to 1822 in Spanish North America. In 1774, on the Baja California Peninsula only, the Dominicans replaced the Franciscans in establishing missions. In 1634, the Jesuits established a mission in Huron territory under the direction of Jean de Brébeuf. :72 The Mission de Sainte-Marie was quite successful, and considered as "the jewel of the Jesuit mission in New France." More than a decade later it was destroyed by traditional Huron enemies, the Iroquois,:2 first in 1648 and again in 1649.:73 The Jesuits were killed along with the Huron. Eight Jesuits—killed between 1642 and 1649—became known as the North American Martyrs. In 1654, the Jesuits started establishing missions among the Iroquois. In 1656 Sainte Marie among the Iroquois (originally known as Sainte-Marie-de-Ganentaa or St. Mary's of Ganantaa) was the first of these new missions to be established, located among the Onondagas under Father Simon Le Moyne. Within thirteen years, the Jesuits had missions among all five Iroquois nations, in part imposed by French attacks against their villages in present-day New York state. However, as relations between the French and the Iroquois were tense, the missions were all abandoned by 1708.:73 Some converted Iroquois and members of other nations migrated to Canada, where they joined the Jesuit mission village of Kahnawake by 1718. By 1667 the Jesuits had established a station near present-day Green Bay, Wisconsin. The Illiniwek whom they met there are reported to have asked the French to send a missionary to them in their home country. In 1668 Father Jacques Marquette was moved by his Jesuit superiors to missions farther up the St. Lawrence River in the western Great Lakes region. He helped found missions at Sault Ste. Marie in present-day Michigan in 1668, St. Ignace in 1671, and at La Pointe on Lake Superior near the present-day city of Ashland, Wisconsin. In 1673, Marquette and French-Canadian explorer Louis Jolliet undertook an additional journey to explore the Mississippi river as far south as the mouth of the Arkansas River. Many of the missionaries compiled studies or dictionaries of the First Nations and Native American languages which they learned. For instance, Jacques Gravier compiled the most extensive Kaskaskia Illinois-French dictionary among works of the missionaries before his death in 1708. It was not edited and published until 2002, but the work has contributed to the Miami Tribe of Oklahoma's language revitalization project with Miami University in Oxford, Ohio. Great Britain took over colonial rule of Canada and the lands east of the Mississippi River in 1763 after the Seven Years' War. In Quebec they allowed the Jesuits to continue to minister to First Nations villages. ^ a b c d e f g h i j k l m n o p q r s t Li, Shenwen (2001). Stratégies missionnaires des Jésuites Français en Nouvelle-France et en Chine au XVIIieme siècle (Print). Sainte-Foy, Québec Paris: Les Presses de l'Université Laval L'Harmattan. ISBN 2-7475-1123-5. ^ a b c Cave, Alfred A. (2004). The French and Indian War. Greenwood Press. ISBN 0-313-32168-X. ^ ""Jacques Marquette", Biography". biography.com. ^ a b c Ekberg, Carl J. (2000). French Roots in the Illinois Country: The Mississippi Frontier in Colonial Times. University of Illinois Press. ISBN 978-0-252-06924-6. ^ a b Masthay, Carl (2004). "Review: Kaskaskia Illinois-to-French Dictionary". International Journal of Lexicography. Oxford Journals. 17 (3): 325–327. doi:10.1093/ijl/17.3.325. Retrieved 2010-03-01. ^ a b c Calloway, Colin Gordon (2006). The Scratch of a Pen: 1763 and the Transformation of North America. Oxford University Press. ISBN 978-0-19-530071-0. Hughes, Thomas (1917). "History of the Society of Jesus in North America". 2. Bedford, Massachusetts: Applewood Books. ISBN 978-1-4290-1833-3. Retrieved August 29, 2012.